In case you haven’t heard the buzz throughout the halls of Leutze, there is a new project on campus called WingSpan. 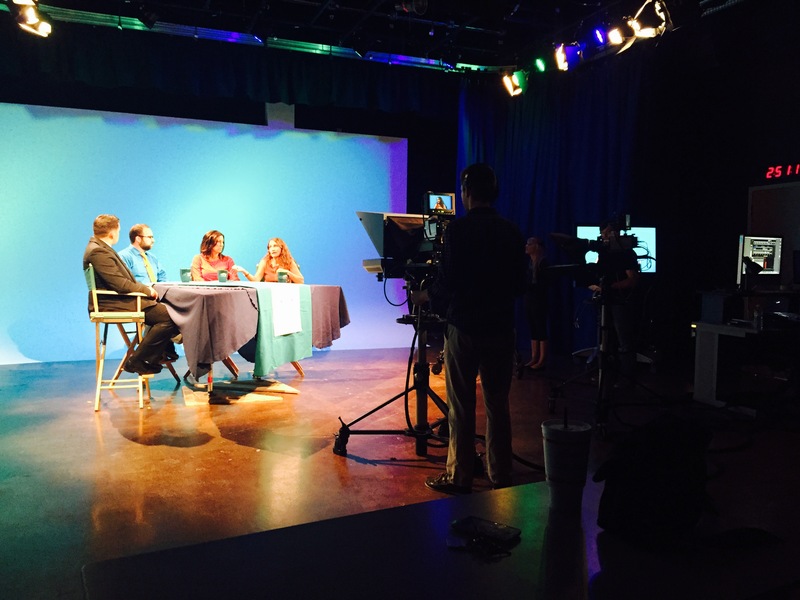 WingSpan is a weekly talk show that discusses political issues with guests who are experts on various topics. In the first episode, Wilmington Mayor Bill Saffo discussed the economic development of Wilmington. During the second episode, County Commissioner Rob Zapple discussed environmental incentives in our region. An ETEAL funded project, WingSpan is produced entirely by COM 351, Media and Politics. The students are responsible for the research, production, and promotion of WingSpan, under the guidance of Dr. Jennifer Brubaker. The first step for branding the television show included a naming contest throughout UNC Wilmington’s campus. Students were encouraged to submit possible names for the show, winning the contest and prizes. This contest raised awareness for WingSpan, and directly engaged one of the show’s publics – college students. For the remainder of the ten-week show, the students are reaching out to different UNCW campus organizations, who pertain to the topic for that week. In the second episode, COM 351 contacted organizations such as The Plastic Ocean Project. They ensured students who are passionate about the environment- to tune in and watch the show that week. WingSpan recognizes the importance of discussing topics that resonate with the students at UNCW. The group of PR and promotion students understand the significant need to have a presence on social media – further connecting and building relationships with the viewers. WingSpan students plan to continually push for the UNCW community to get involved through social media interaction, using the hashtag #WingSpan. Media’s role is to tell you what to think, not how to think. According to the Agenda Setting Theory, mass media has the ability to transfer the salience of issues on the news agenda to the public agenda. WingSpan recognizes the importance of remaining unbiased, and simply giving viewers the tools necessary to form their own opinions on political topics. The twitter account raises political issues with its followers and encourages discussions, without a bias toward one opinion over another. As represented by the tweet, WingSpan is presenting the political issue of education. Wingspan encourages the community to think about and discuss the topic, by sharing data regarding the educational system. It is evident the students understand their roles and goals: to inform students and the community about political issues. COM 351 Media and Politics encourages students, faculty/staff, and the Wilmington community to think about political issues, not how to think about them. In a city that has been a production hub for many years- it is an exciting opportunity for UNCW students to experience the other side of television, first hand. You can follow WingSpan on Facebook, Twitter, and Instagram, and tune in on Fridays at Noon on www.uncwingspan.com, or Mondays and Wednesdays at 6pm on TLN. I found this article very interesting. I enjoy seeing a production for students by students. This will allow for the show to hit particular needs and interest in which we all have. Also, I found it interesting on how you get people who are experts on the topic, or going to organizations on campus that are associated with the particular topic. What sold me on this item, was when the article mentioned not wanting to force items onto someone’s thoughts, but make them think on it. Also, grabbing guest that are unbiased and can see both sides of an issue, which personally allows for a better discussion. I hope this show becomes very successful, and especially hope it grows. I am very excited to see the show in production. I think it is great that there will be a show like this that will provide insight to us on what we don’t hear in the news about politics. I would love to hear about the opinions of the presidential hopefuls from the students on the show and also the local government officials that are brought on. I think the show will be a huge hit and also very informative about key issues with Wilmington and the country. I think it is essential to a community of young people to be able to listen or connect with public officials. It is even more exciting to see fellow Seahawks film, edit, and publish important student projects; projects that actually involve real world experience instead of the normal theory based learning. I am excited to see Wingspan become a way to access official news (straight from the source in some cases) rather than reading it from a third party news writer or an even further removed source. I will look forward to hearing from public officials and their plans for improving the future.